Of days that have been. Of the life I have built. In March, Mom told me she wanted to make me a bow tie quilt. 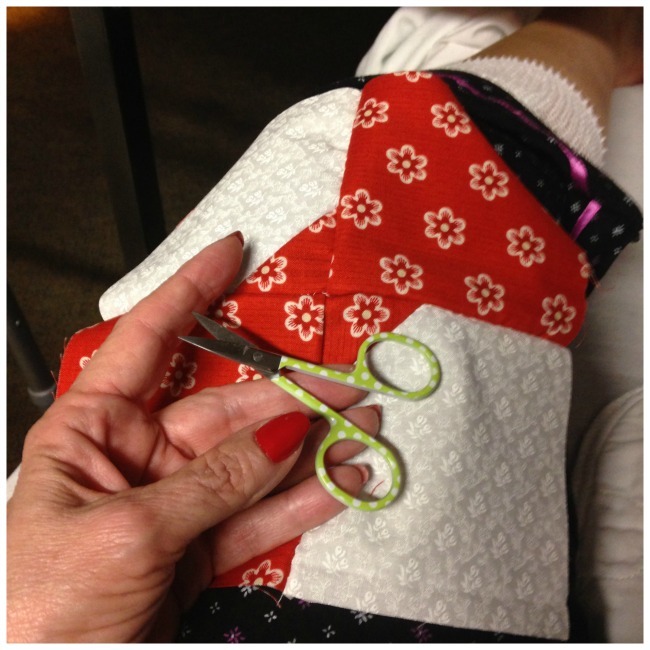 A little hand stitching to work on while recovering from knee replacement. I was completely thrilled. I wanted it red and white. 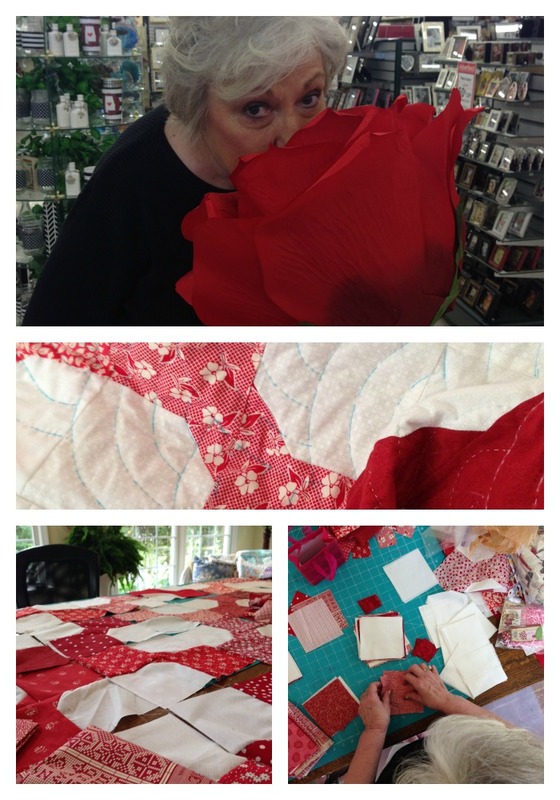 We started picking through our fabrics and picking up red and white fabrics here and there and got together several times to cut out fabrics. Our first squares were made in Searcy, Arkansas visiting Chad, Easter weekend. Mom made a square at each place we stayed on this trip. One in Lori’s cottage and her parents house, many in our cousin’s home in Texas. We also picked up fabrics from Lori’s mom, Kathie and a couple of neat quilt shops in Texas. Mom got a good jump-start on them before time for her surgery. I stitched one in the waiting room…. and in her hospital room…. and rehab room. 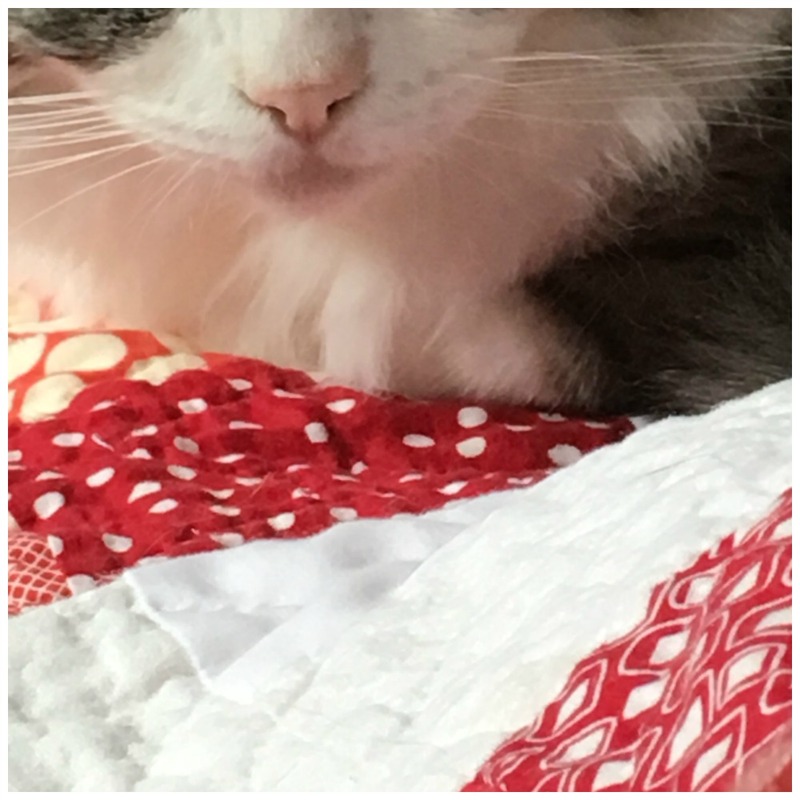 It was many weeks before MOM picked up the quilting again. I snapped this one below and you can see her knee still wrapped. My heart warmed as I came into her rehab room and saw her stitching again. A healing sign. Months later when we had enough squares, we spread out all our squares and arranged them and rearranged and mom sewed them together. And the long process of hand quitting began. 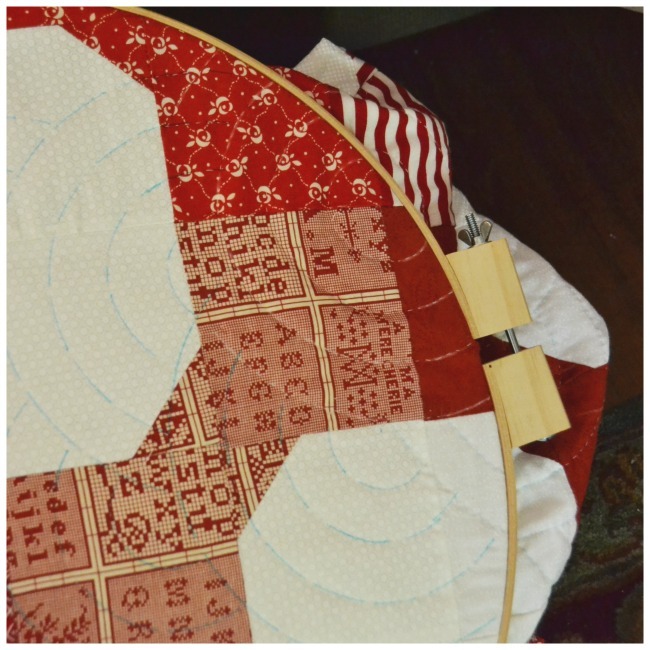 Only very special quilts get hand stitched. Happy mine is one of them. 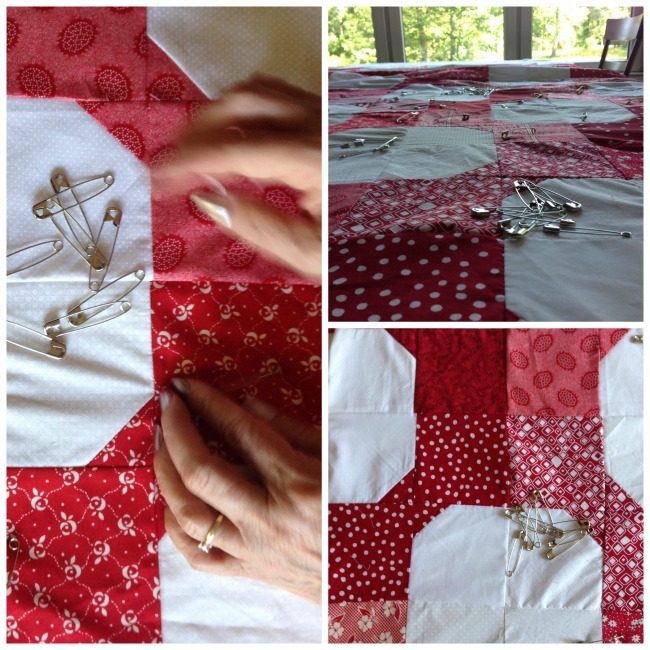 Each time I visited mom, she would spread out the quilt and show me her progress. 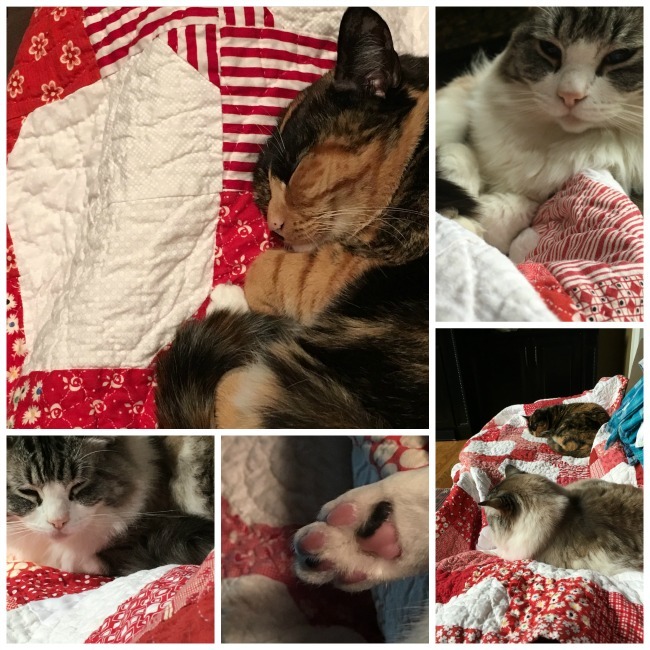 The precious quilt had stitches added daily for several months. 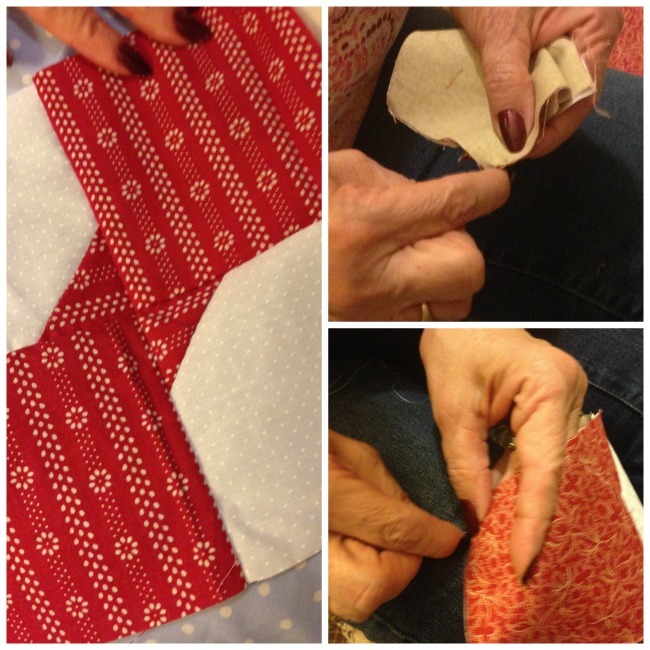 When Mom fell and broke her hip it was weeks and weeks and weeks before she thought of stitching again. 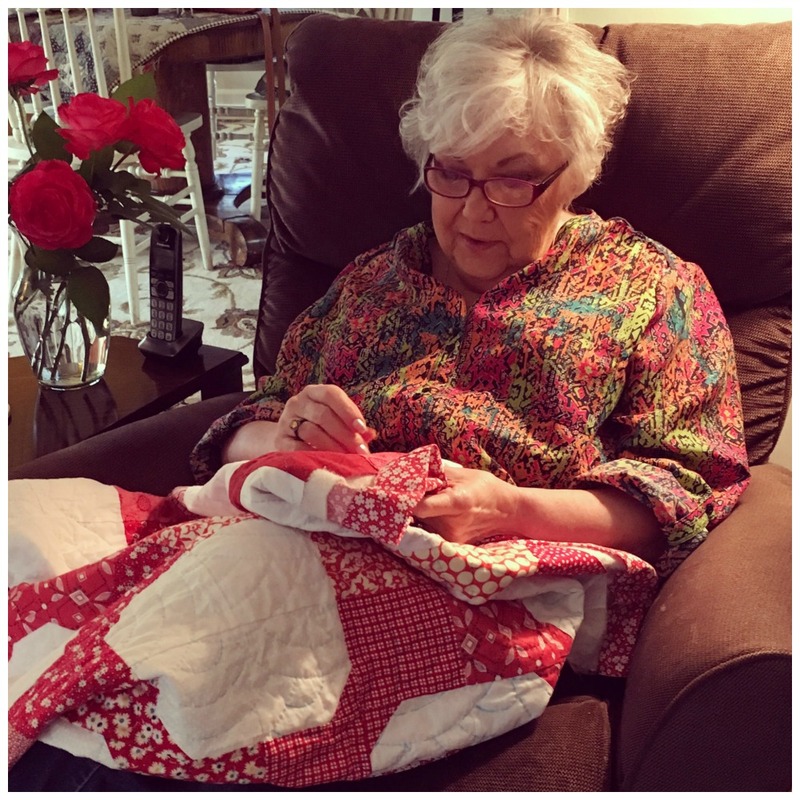 She would tell me she would look at the quilt untouched and feel like she should be stitching but couldn’t wrap her brain around it yet. I told her she would one day and sure enough she did. A healing sign. Then one day I get a text that she’s working on the binding. The day it was finally done, Mom was bringing it to church. I was home sick with an inner ear infection, that was giving me vertigo. Kevin likes to tell the story of me ready for church but running into the hallway walls and holding on to the back to the sofa to keep from falling over but determined to go to church to get my quilt. Kevin finally called my parents and invited them over after church in order to keep me home. Then he acted out me falling into the walls saying, “I’ve got to get my quilt” This quilt was instantly adopted by both cats! We’ve taken many a nap under its comfort. The poem’s words are so true. These stitches were made in good times and bad, rain and sunshine, heartache and thankfulness, and treasured times together. All from the hands of a giver who never gave up, and strived to bounce back. A precious gift from my mom in a year that I will never forget. Much love to the giver. 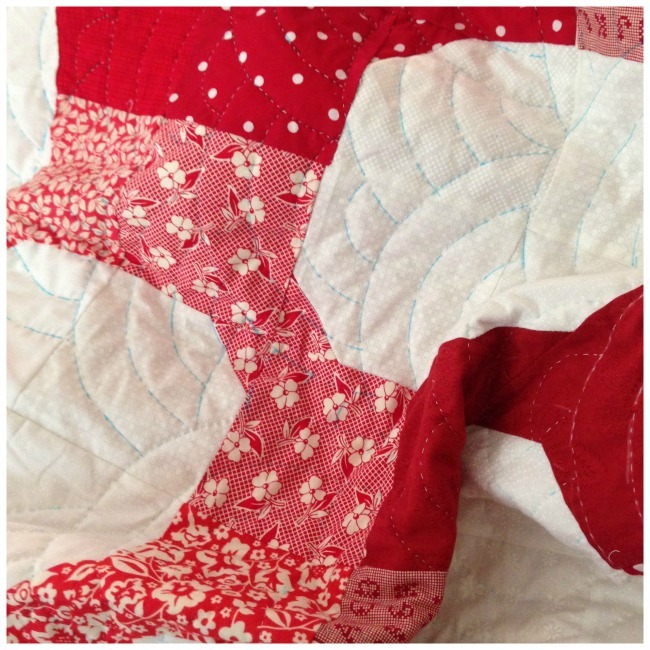 This entry was posted in a good read and tagged bowtie, family, mom, quilt, quilting by Katey. Bookmark the permalink. My favorite kind of story! Happy Endings are always the best stories. Thank you Gay Lynn. Thank you Jo. I do love my parents so very much. I treasure each day with them. Nina, I thought about your quilt when I wrote the words about the special ones that are hand quilted. Thank you always. Oh, Katey, what a beautiful love story! 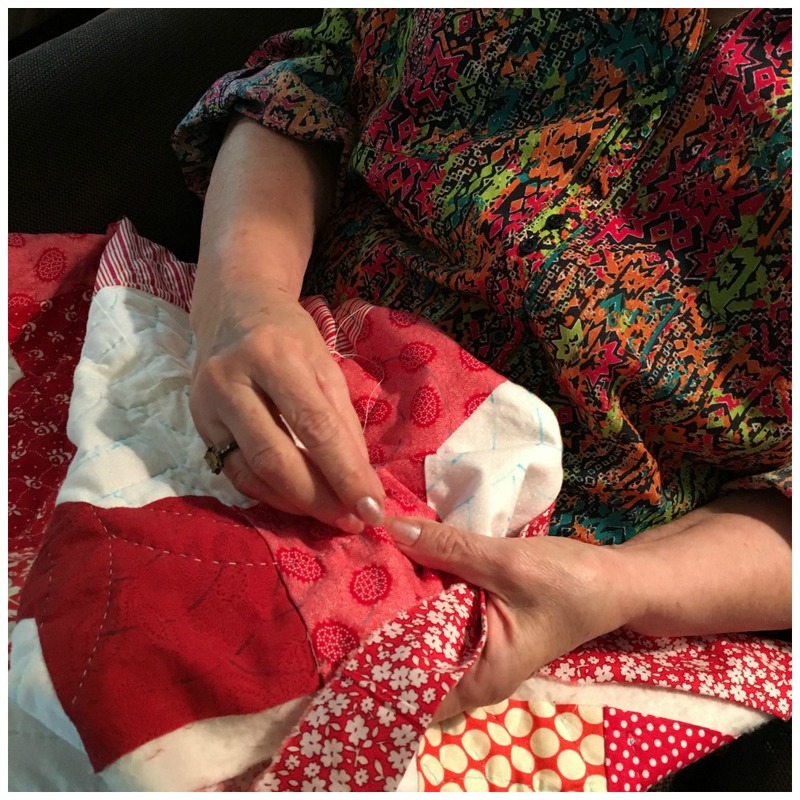 This is indeed more than a quilt, it is the story of a segment of your life and Dian’s. Your mom is so precious to me–don’t know what I would have done without her this past year, or how I would keep going without the love and support she and your “Deddy” (and our “Fourth Musketeer,” Gloria) show to me daily. You are the product of a lovely couple, and a very lovely product you are! So thankful for all of you! Truly it is a beautiful love story. I am sorry for the year you too have had but thankful comfort can be found in the love of my family. Annie was curled up on my quilt the whole time I typed my post. Both bringing comfort always. Katey, I love it! And it is your mom’s kind of sweet and giving spirit that works miracles in healing. A reason to get better. She looks beautiful and you do, too, and Annie. 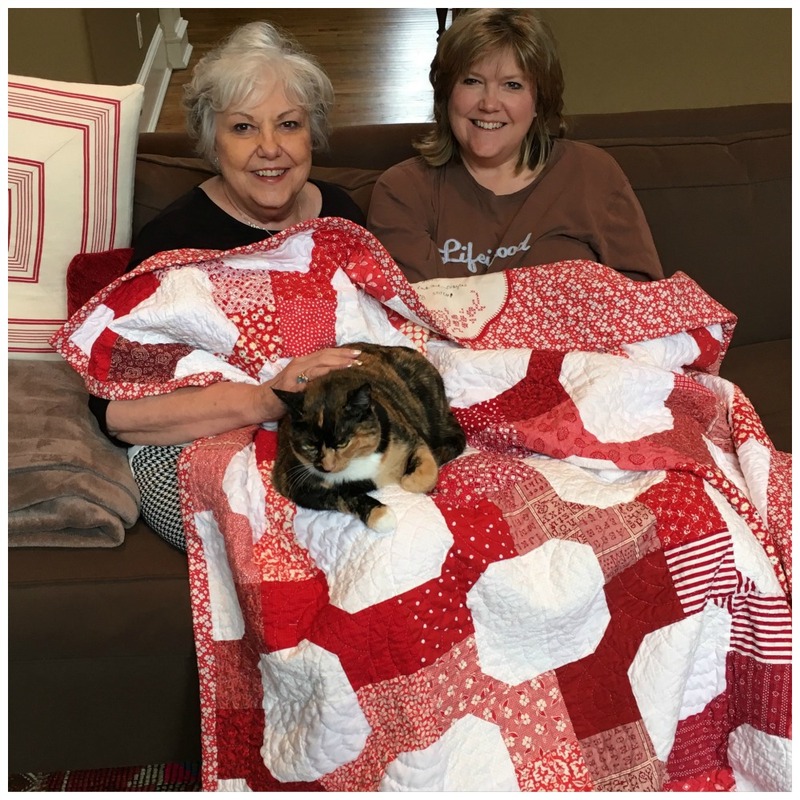 I don’t know Annie’s friend but I am sure they love that quilt almost as much as you do. When we were kids we had a quilt that was made from scraps of everything we had worn or dug out of a closet or ever seen. I can remember the three of us (we had one baby brother to go) lying on it on a rainy day and trying to name where every fabric came from because I am sure none of it was bought. Each square had a history. The funny thing is that I have no idea who made it. My mother and neither of my grandmothers quilted. Perhaps the angel Ida Mae who kept us some when we were young. My sister still has it and I hope she remembers that the blue plaid was a housecoat that my mom made for me for Christmas one year. Knowing my sister, she remembers where every scrap came from. She is really good at things like that. 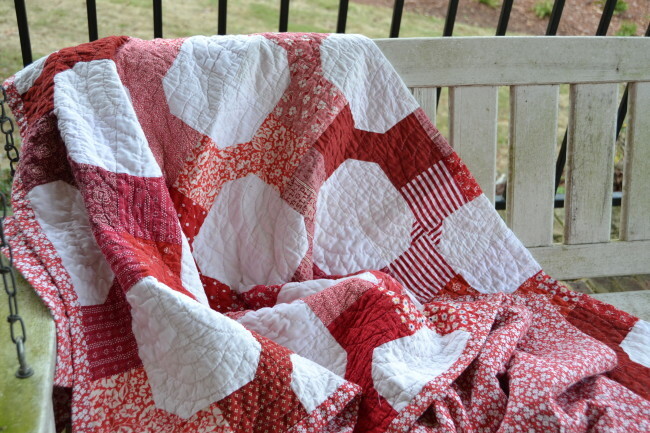 I love the quilt and that your mom is doing well but what I would REALLY like is a video of Kevin doing the “Katey going to church dance.” Will you tell him for me? Katey, this recounting warms my heart so! It brings back the happy memory of you & your mom, both so dear to my parents & me, visiting us at the lake. It reminds me of the prayers for Dian while she was struggling & the joy we felt when she was mending, especially when I got the phone call from her in person, sounding so good! Thank you for sharing this, sweet friend, and love to you all! Lori, I have such good memories from our visit. Little did we know the year that we had in store for us. Thankful now that we were able to make it. I wish I had taken a picture of the stack your mom shared with us.